Oilsands giant Syncrude Canada will pay a $3-million penalty in the deaths of 1,600 ducks in one of its toxic tailings ponds in April 2008. Oilsands giant Syncrude Canada will pay a $3-million penalty for the deaths of 1,600 ducks in one of its toxic tailings ponds in April 2008. Syncrude lawyers and federal and provincial prosecutors presented the deal Friday morning in provincial court in St. Albert, Alta., and Judge Ken Tjosvold accepted it. 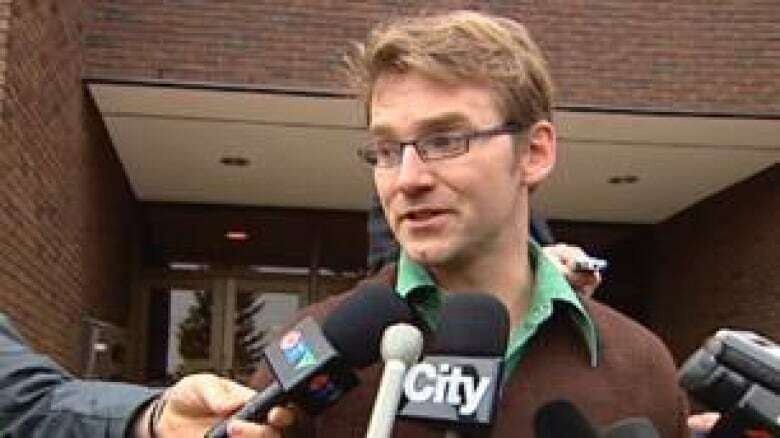 Syncrude lawyer Jack Marshall told the court that the company apologizes for the incident and recognizes it must do much better when it comes to protecting wildlife. Syncrude was fined the maximum under the applicable federal and provincial laws: $300,000 for the federal charge and $500,000 for the provincial charge. A research project into bird migration and the effectiveness of bird deterrents at the University of Alberta will also receive $1.3 million. Other beneficiaries include the Alberta Conservation Association, which will receive $900,000, and the environmental program at Keyano College in Fort McMurray, which will receive half of the $500,000 provincial fine. "Syncrude is eager to move forward from this incident. It's haunted us and it's something that we sincerely regret and have from the beginning," said Syncrude spokeswoman Cheryl Robb. 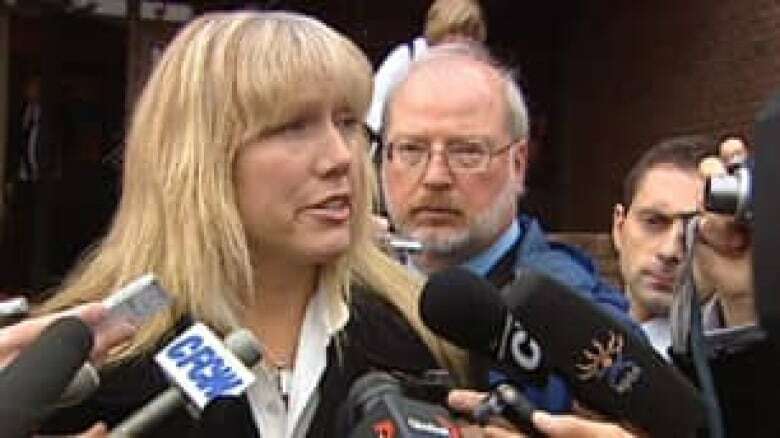 Syncrude spokeswoman Cheryl Robb speaks to reporters outside the courthouse Friday in St. Albert, Alta. ((CBC))"We've learned a lot and we made significant changes to our system and we're ready to move forward." Provincial Crown prosecutor Susan McRory said she was pleased the judge accepted the terms of the sentencing agreement. "The company has taken responsibility, the laws have been enforced, and the penalty will hopefully prevent anything like this from ever happening again," she said. Alberta Energy Minister Ron Liepert wouldn't comment specifically on the court decision but said it sends a message to industry that the province will take action if environmental policies are breached. "This whole process … shows that if there is a breach of an environmental regulation or legislation, that we are prepared to take action," he said. "We did and the process unfolded and this is the culmination of it." In Vancouver, federal Environment Minister Jim Prentice said the fine was the largest in Canadian history for an environmental offence. "I think this shows that we have strong environmental laws in Canada and that we will enforce them," Prentice said. "What happened with the duck incident in the oilsands was completely unacceptable, it was an embarrassment to Canada when it took place, and so, the severity of the fine really reflects that." But Greenpeace campaigner Mike Hudema said the sentence was disappointing. Greenpeace campaigner Mike Hudema doesn't think the fine provides much of a deterrent. ((CBC))"A $3-million fine to a multi-billion dollar company equates to a slap on the wrist," he said. "This doesn't send a very strong message to the industry that Alberta or the federal government is really serious about enforcing our legislation or that crimes like this can't happen in the future." Hudema said the fine could have been higher if Syncrude was levied an amount for each duck that perished in the tailings pond. Syncrude was found guilty in June on federal and provincial environmental charges over the duck deaths in its Aurora tailings pond in 2008. Sentencing was supposed to take place in August, but that was put on hold when it appeared the sides were close to working out a deal. The trial earlier this year took two months. Syncrude tried to argue that it made a mistake but shouldn't be punished. 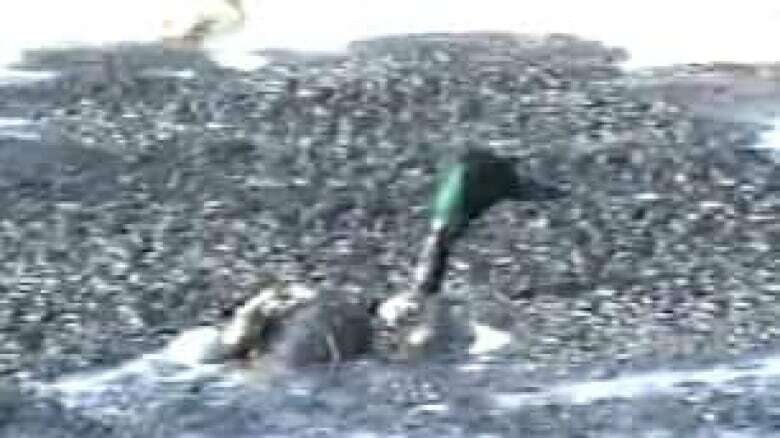 The company claimed it failed to have enough air cannons in place to scare migratory birds away from the tailings pond. The argument failed and guilty verdicts were returned, marking the first time an oilsands company had been sanctioned in court for failing to operate a tailings pond properly.